The Grepon Power delivers high performance in cool environments with a lightweight and breathable, warm fabric. The Polartec Powerstretch Pro's unique double-surface construction offers an exceptiona l warmth-to-weight ratio, while keeping high breathability and stretch performance. The moisture wicking inner surface ensures comfort and its anti-pilling outer surface guarantees abrasion resistance. The Alpine Fit reduces bulk around the body and gives enough room for unrestricted movement and the adjustable hem ensures the jacket follows your body movement. A quick access chest pocket allows to stow small items. With this degree of moisture management, the Grepon Power jacket can be worn through a whole ramble, so you can concentrate on your technique. For over 80 years, MILLET has been committed to designing ever more technical and efficient products. This commitment to you also serves to protect our mountain playground. Because we want the mountains to be beautiful, we are limiting the environmental impact of our activities. 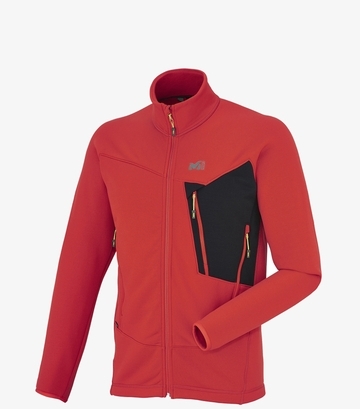 This jacket is rated as a Low Impact product by Millet, which means it fulfills at least one of two eco-design criteria: the use of low-impact materials (recycled, organic, Ecoya, Ariaprene, Sorona, HEMP, tencel, linen, certified wool, RDS) or certified components (Bluesign, Oeko-Tex and GOTS, among others).